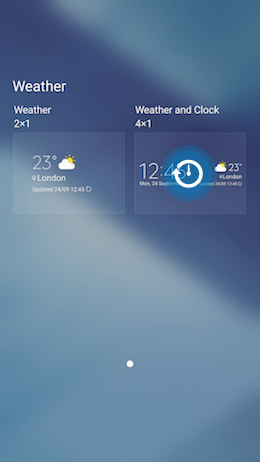 A Widget is an interactive item that can be added to the Home screens of your device to give you quick access to information or tasks you perform frequently (weather updates, calendar events and many others). 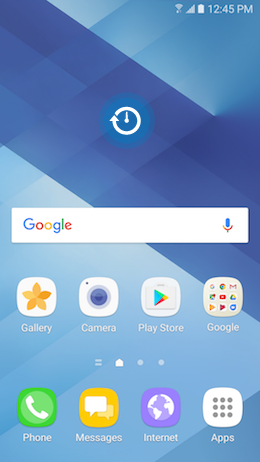 With the previous version of Android (Lollipop), you were used to have the Weather and Clock widget displayed on the main Home screen of your Samsung device. With the new version of Android (Marshmallow) this widget is not displayed by default on your Home Screen. 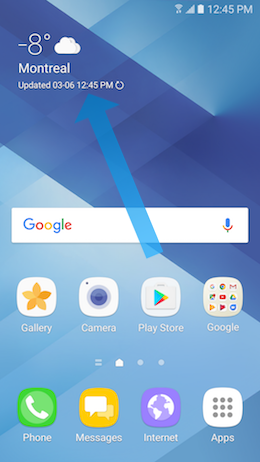 Take the following steps to add the Weather and Clock widget on the Home Screen of your Galaxy A5 (2017), so it can look like your previous Samsung device. 1 Touch and hold the widget you want to remove. Then drag it to the Remove icon that will appear at the top of the screen. 2 This operation will not delete permanently the widget. The widget is only removed from the Home screen. You can add it back or add another Widget using the Widgets menu (see next section). 1 To add a widget, touch and hold an empty area on one of your Home screen. You can also pinch your fingers together on the screen to acces the menu. 3 Swipe to the right or to the left until you find the Weather widgets. 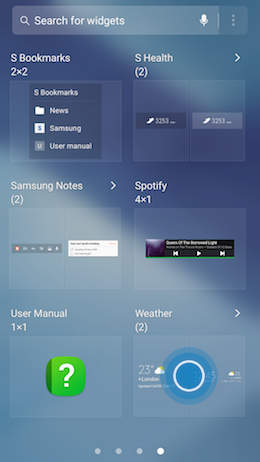 4 Some widgets are organized in categories. Touch a category to access all the availble widgets, related to this category. For this example, we selected Weather. 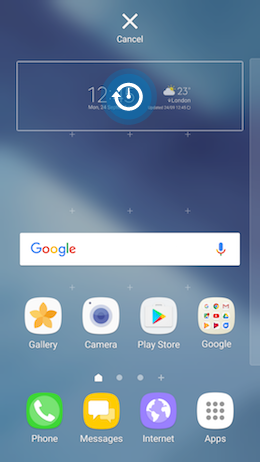 This category holds the Weather and the Weather and Clock widgets. 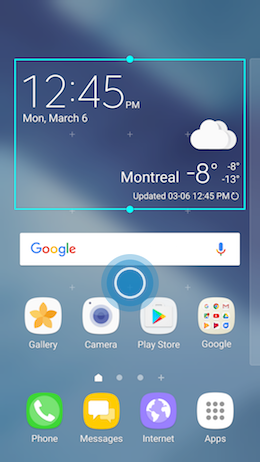 5 Touch and hold the Weather and Clock widget, then drag it to a Home screen and release it. 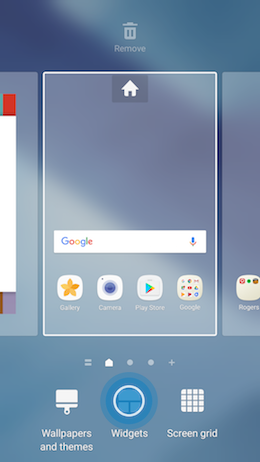 Adjust the size of the widget by dragging the frame around it, if required. 6 Then touch an area outside the widget to save it. Touch the widget to access the corresponding information or action. For the widget used for this example (Weather and Clock), touch the icon representing a cloud to add the weather forecast corresponding to your city.